My 9 year old is an avid book reader. He will often finish books from the library within a day or two and seems to just consume them. When "The Book of Heroes" and "The Book of Heroines" showed up at our door, I knew he would love them! I showed them to him when he got home from school and I don't think he set those books down for the rest of the day. He took them to his brother's soccer game that night, and to school the next morning. Suddenly I was hearing random facts about amazing people while he read through the books. Basically, they were a hit here! I got to explain to my son what a heroine is, and it gave him the opportunity to realize that heroes and heroines can be anyone, from a kid, to a dog, to a woman or man. These aren't people with super powers, just people who did amazing things. I love that they are published by National Geographic, so I know the books are well-written and factual. 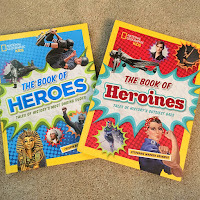 "The Book of Heroes" and "The Book of Heroines" are wonderful for kids from ages 8-12, and are a great resource for kids to learn about many people in an easy-to-read format. All-in-all I was very impressed with the quality of these books and my son loves them. I'm excited to add them to our home library to be used for many years to come. I also love that it encourages kids to read about women who changed the world through their heroic actions...sometime women don't get nearly as much credit as they should. What about you? 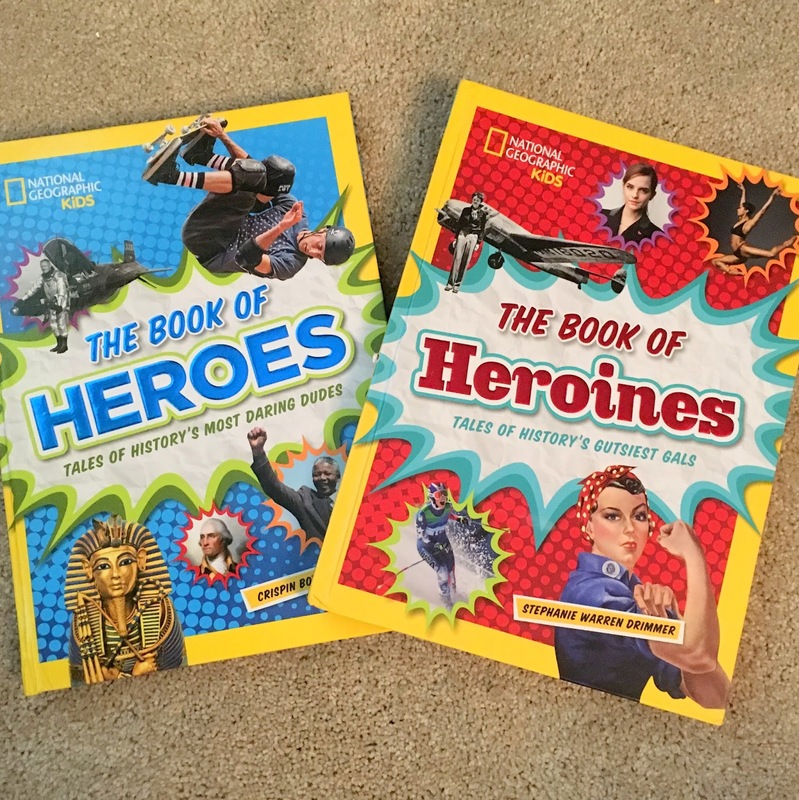 Which hero or heroine would you love to see in these books? You can enter below to win your own copies of these awesome books! Disclosure: I received this product for free from Moms Meet (momsmeet.com), May Media Group LLC, who received it directly from the manufacturer. As a Moms Meet blogger, I agree to use this product and post my honest opinion on my blog. The opinions posted are my own. a Rafflecopter giveaway To learn more or to buy these books, you can find them on Amazon (Heroes and Heroines). 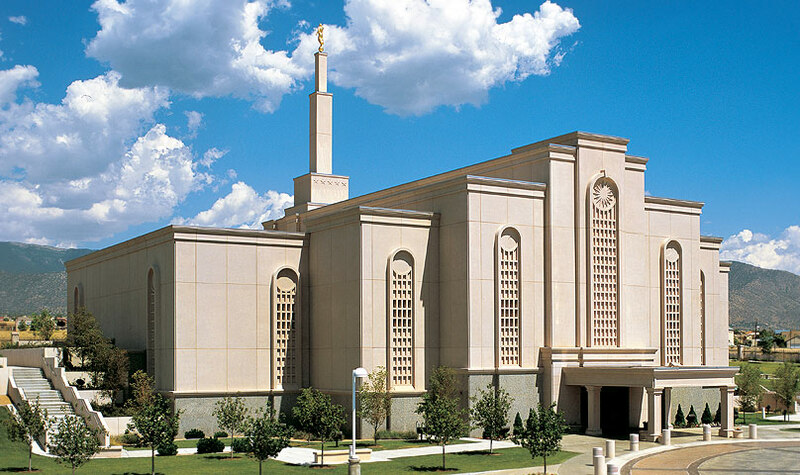 Also be sure to visit National Geographic, Facebook, and Twitter. These books look awesome! I'm always looking for good books for my kids, thanks! A hero in my life is my husband who helped me haul dirt after a long and stressful day at work. My hero is really my sister=in-law. When she did not have hope for surviving cancer, she still lived 18 months. She endured more issues and treatments than the doctors thought anyone can. My Hero is my mother who battled breast cancer. With God's help she beat it. My Mom is my hero, she is always upbeat, thoughtful and generous with everyone! My hero is my mom who was a widow for over 40 years and raised 5 kids! My hero/heroine is my mom who raised 5 children and was a widow for over 40 years. My wife is my hero who raises our 3 kids while working crazy obscure hours and gets them to appointments on time. My mom, who is currently battling pancreatic cancer, has always been and will always be my hero! My hero is Jane Goodall. Our family loves superheroes. My hero is my grandmother.